I wanted to explore two different ways to view a ring, from the side and from the top. This ring totally rocks. I love it. 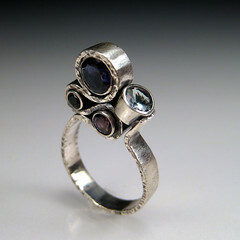 I love the dimensionality of this ring! It's an interesting idea setting the stones sideways like that. And of course, I love the texture, too.